On July 1, Dr. Mike Frandsen began his term as interim president for the 2013-14 year. 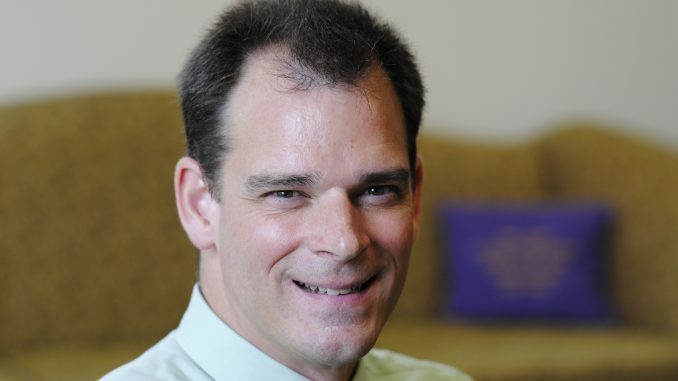 Frandsen has previously served as the college’s VP of finance and administration, the director of the Gerstacker Institute and an assistant professor of economics and management. The Pleiad met with him to discuss the changes facing the college this upcoming year. The Pleiad: Thank you so much for sitting down with me. This is the first time that The Pleiad is publishing articles directly aimed at first-year students. There have been a lot of changes on campus this past summer, including your new role. Can you talk about that change from VP of finance and administration to interim president? Frandsen: You know, I think it has gone pretty smoothly, and the big part of that has been that I’ve been here for nine years already. I’ve been in different roles across campus, so I know the people and the processes – not everything about how things work, but I’ve got a lot of relationships across campus because of that. I’ve said this a lot lately. I’ve told students for a long time the best job is the one in which you learn the most. I have an absolutely fantastic job by that measure. How is your role as interim president different than Dr. Randall’s role as president? I’m a temp. There’s a search going on and the search committee is working to determine who will hold this role on a continuing basis. No one holds any role on a permanent basis. That process is underway. Did she give you any advice before she left to serve as Chancellor? She did, and you know she and I had a very close working relationship. She gave me lots of different pieces of advice. It’s hard to put my finger on it that I would single out as most important. She and I continue to work together with her in her role as chancellor. Can you talk about some of the challenges you’ll face this upcoming year? One challenge certainly is that this is in an interim role, and that could lead to slow down or stagnation, but my charge from the board is quite clear. That’s not what they’re looking for. You know our enrollment is not what it needs to be, and that is an ongoing challenge for all of us. Is there anything you hope to accomplish during your term as interim president? There are some things, and there are some things that I’m kind of keeping under the radar right now, but I’ll give you one that you can start to publicize. You may have seen these [posters] around campus. “Just One More” is the idea that we all need to get more engaged in what goes on around here. Staring with the board and continuing with everybody here from faculty, staff, students, I want people to get to just one more event on campus. You can set the time frame. Maybe it’s just one more a week. Maybe it’s just one more in the semester. We have trustees who are all over the country. Maybe for them it’s one more a semester. Get to just one more event, and beyond that, get to just one more type of event than you would ordinarily go to. If you’re a huge volleyball fan, and you get to all the volleyball games, then go to a concert. If you never miss a concert, but you’ve never been to a football game, get yourself to a football game. One more event and one more type of event for everybody. Which successes of the college are you most proud of right now? There are so many individual successes. Josh Cassada [’95 alumnus] being invited to train to be an astronaut is a great thing. If you haven’t seen it yet, the video that Alexa Hyman [Hinsdale, Ill. junior] created, the “Why Albion,” is a great thing. The fact that we created the Baldwin renovations on time and under budget and have a tremendous new venue to serve our students, faculty and staff is a great thing. You know, again it’s hard to point to one. There are so many all the time. How do you think the college will change during this period of transition? You know, I studied leadership in college for my doctoral program. How things change depends on all of us, not just on me by a long stretch. I hope that one of the things that changes is that we have a stronger sense of community, and that we do more to celebrate that community and celebrate our successes. And I hope also that we become a more visible and engaged citizen in the community. Lots of individual involvement in the community, but I think institutionally I’d like to see us more engaged in the community. For first-year students, one of the ways that we’re working to start that is the service projects they’re going to be working on Sunday. Has the Board of Trustees and the Presidential Search Committee narrowed down any possibilities for Albion’s 16th president? I don’t know. You’d have to ask somebody on the search committee. And are you interested in serving as the 16th president? You know, one of the things about these searches is they keep things highly confidential, so I’m going to respect the confidentiality of the search. And lastly, what guidance would you give to first-year students who are new to campus? I just gave guidance at SOAR this morning and I gave them three challenges. I would ask that you repeat them because maybe they’ll stick. Take a course that you and your friends and family would never have imagined that you’d take. Get involved in an activity that you’d never thought about or had an experience with before. And spend time with people who are different than yourself. This Q&A has a corrected introduction. The original posting included an error made by the reporter while adding biographical information from a college news release, which led to our stating Dr. Frandsen previously served Albion College as an associate professor of economics and management. As stated correctly in the source document, Dr. Frandsen was previously an assistant professor of economics and management. The Pleiad regrets the error.